Jere, Epah win Zambian Sports crowns! IM Daniel Jere at 2012 Chess Olympiad. 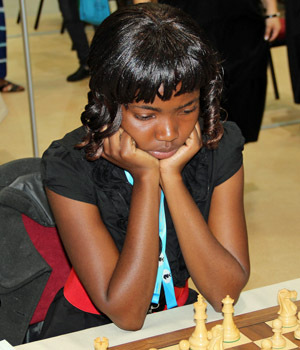 Zambia has been riding a wave of chess success in the past year. 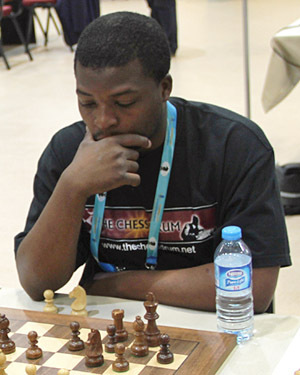 While not duplicating the team success of the 2010 Chess Olympiad in Khanty-Mansisyk, Zambian players have seen a number of individual accolades. There is now serious talk about Zambia getting its second Grandmaster after the legendary Amon Simutowe. Stanley Chumfwa was finally awarded his International Master’s title earned in 2005 and his brother Kelvin Chumfwa just won the 2012 Botswana Open. The third consecutive year that a Zambezi player has won. Upon returning from the Olympiad in Istanbul, Turkey, Zambia was charting a direction of progress. With native son Amon Simutowe having served as a trailblazer, there are others following his path. In fact, IM Daniel Jere and WCM Epah Tembo have followed Simutowe by winning the top award for individual sport. Simutowe won the award for the year 2000 when he was taking the chess world by storm. Jere and Tembo, who are engaged, celebrated the awards. Tembo stated, “We are the best chess couple.” There are perhaps a dozen high-profile chess couples, but this is certainly a first for Zambia. Let us hope that sponsorship is forthcoming so that Zambia can turn copper to gold. There is a controversy brewing in Zambia after an announcement that Epah Tembo is retiring from international play at 18 years old. This in the aftermath of winning the sports award for top female athlete. If Stanley Chumfra was finally awarded his IM title that he earned in ’05, then perhaps Farai Mandizha might one day get his IM title that he earned in ’10. Great to hear! I guess I should’ve noticed looking at the pairings at the Olympiad. It appears that I was so used to cringing after seeing “FM” that I developed a half-blindness LOL. Can anyone tell me where there is a good place in Lusaka to play chess? I’m not sure about Lusaka, but a workmate of mine plays Blitz at a certain place in either Kabwata…..!! I haven’t been there in a while, as i had so many commitments, newly wed, work, moving, setting up home,…etc…! Only played one game this year with a friend. Thank you for your input. I’m not very familiar with Kabwata as I just moved to Zambia recently. Somewhere on the internet I read that the Russian Cultural Center in Lusaka organizes chess sessions but am not sure if this is still the case. Am also playing on the playchess.com server but seems that I am the only player based in Zambia there. I just thought that in a country where the national sportsman of the year was awarded to a chessplayer there should be some chess venues around. I mean this is pretty impressive for Zambia as in other countries you would still have to convince people that chess is a sport. Raphael, Zone 4 chess league games are played on saturdays at the russian centre starting 14:00hrs Lusaka time. If you show up there, you will get all the information you need. Very helpful post Emmanuel. Will try to find some time next Saturday. Thanx a bunch! Raphael, If you are interested in blitz chess at its craziest, come to Lusaka City market, the largest market in Lusaka. There, you will find an assortment of chess players like Daniel Jere, Chitumbo Mwali and many more lesser strong players. It’s a social place were we all interact and have fun. There are people there every day from around 10 hrs to when the market closes. After the market closes, there are other nearby restaurants were we go to continue the fun until after 20 hrs. If your interest is in slower chess, you will still be able to link up with people who prefer “thinkage”. For the chess league, you can come to Lusaka’s Russian Centre along Freedom way every saturday. I personally believe this market venue has really contributed to making very strong Zambian chess players and we will really be glad to welcome you Raphael. am very glad to get some very useful responses on this site. I will definitely consider going to the City Market during the weekend. Although, I’m not really looking forward to getting battered by 2000+ players. Fortunately, you will be able to find players of around the same strengh as yourself and choose to just play with those. Even some of us avoid such subtle players like jere or the chumfwa brothers and blitz wolves like Katebe or Chitumbo and prefer reserved and more sane players. It’s an humble and simple place but very enjoyable to be at. Hey Darius. Thank you for this most useful information. Am just new in Lusaka. According to Google Maps the city market is along Chiparamba Rd. Is this correct? So in case I go to the City Market on the weekend is this chess venue easy to find or is this more of a secretive society where I would need to find the right contact persons, search for hidden doors and secret passageways, answer a number of secret questions until I discover the candlelit underground chess corner? The market is actually at the junction of Lumumba and Los Angeles roads, just by the traffic lights. I don’t know what time you’ll be in town on saturday but, if you don’t mind you can call me and I can take you to the place. My number is 0966-745872. But many people who dont participate in tournaments or play blitz and the like, prefer to play in most quiet environments where they can have “healthy” competition,… Not to be embarassed by the 2000+ opposition you are referring to,…! For those who like “thinkage” like myself, such places wont go down for me as i easily get distracted, and since im not consistent in playing chess, i tend to think longer than what could be considered “than usual”…..! Quite a good player i must say…!